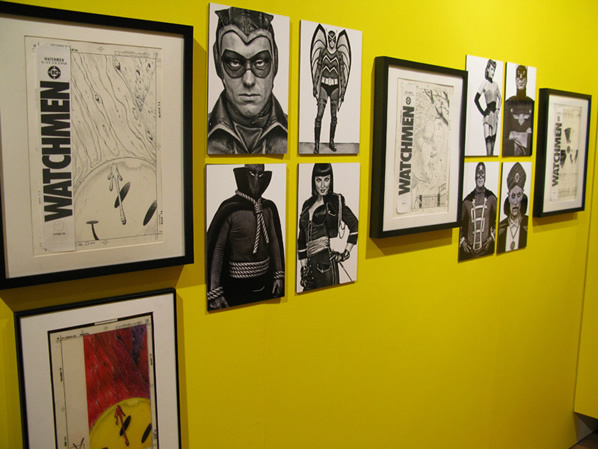 The Museum of Comic and Cartoon Art, or MoCCA for short, is presenting an exhibit titled “The Art of Watchmen” from now until May 2, 2009 at their galleries in New York City. 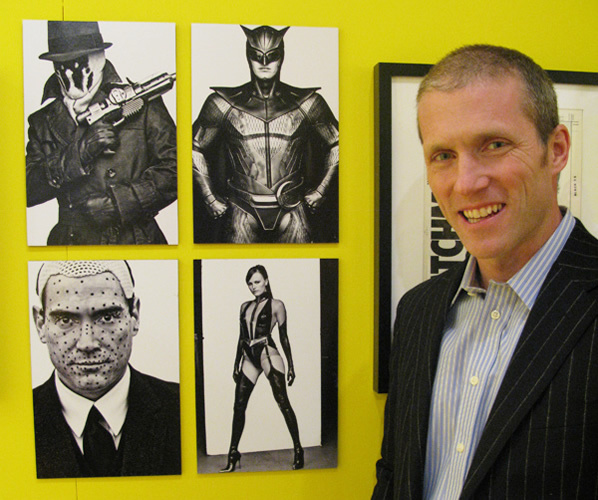 On view will be photographs by Clay Enos of the Watchmen movie cast and original artwork from the graphic novel co-created and illustrated by Dave Gibbons. “The Art of Watchmen” explores the way in which the comics and cinema versions each combine fiction with reality to create an alternative universe that provides incisive commentary on our contemporary times. The exhibition will focus on visual iconography from Watchmen, primarily the main characters: The Comedian, Dr. Manhattan, Nite Owl, Ozymandias, Silk Spectre, and Rorschach. The exhibit will show how each character evolved, through artist Dave Gibbons’ concept sketches to their depiction in the comics culminating in their incarnations on screen. “The Art of Watchmen” is curated by Peter Sanderson and Ellen S. Abramowitz who gave a guided tour of the exhibit on public television station WNET's Sunday Arts program. 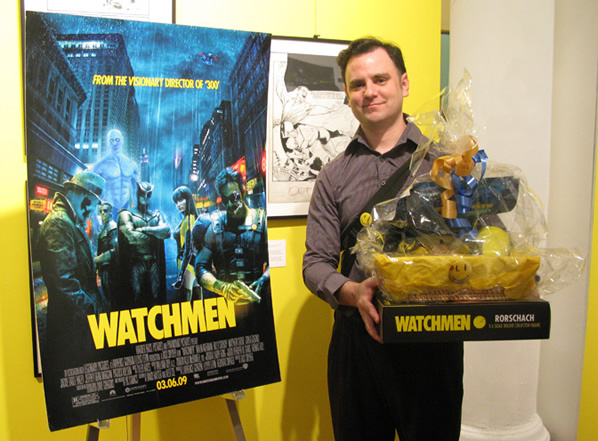 WatchmenComicMovie was at MoCCA for the exhibit's launch party event which took place on March 5th, 2009. 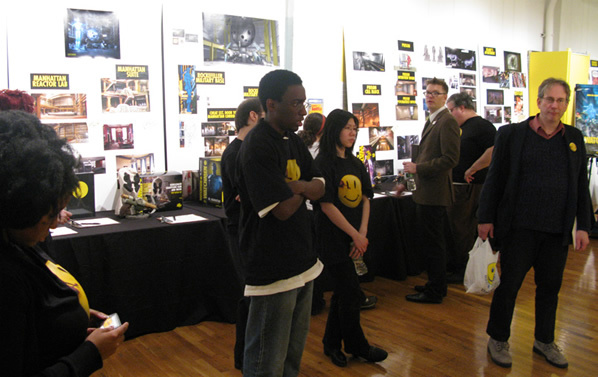 The following are some photos taken of the exhibit and the event's guests that night. Original Watchmen cover art by Dave Gibbons with Clay Enos’s portrait photos. Watchmen set photographer Clay Enos poses with his portrait photos. 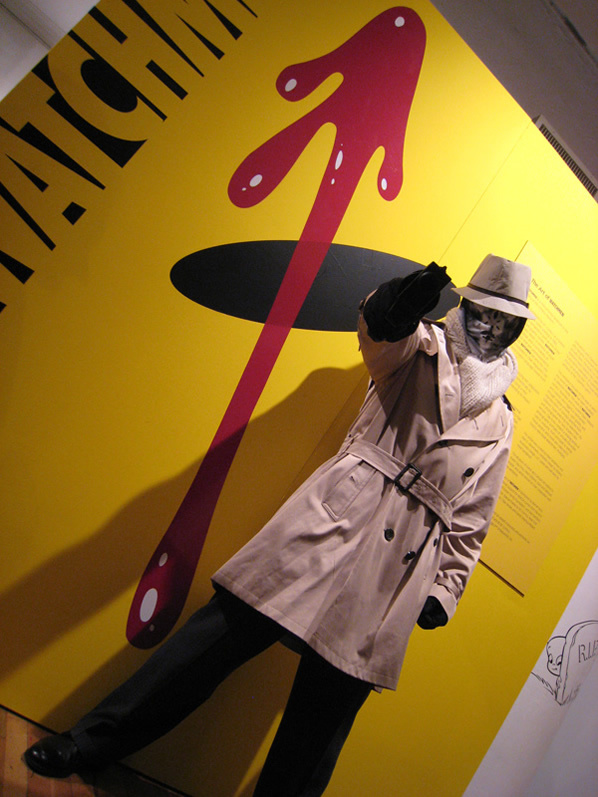 A fan dressed as Rorschach makes and appearance at the exhibit. WatchmenComicMovie’s Comedian Carl shows off some swag won at the silent auction.